Light up your life with lighting from Destination Lighting, online at DestinationLighting.com. Whether you're searching for indoor or outdoor lighting, Destination Lighting has everything you'll need to brighten up your life. With top brands including Hinkley, Juno, Kichler, Maxlite, Philips, and more, you know you're getting quality products. Not only can you find floor lamps, sconces, chandeliers, and flood lighting, but you can also find all the hardware you'll need to get your lighting installed. Lighten up the price by stopping by RetailSteal.com for top Destination Lighting coupon codes, Destination Lighting discounts, and Destination Lighting promotions. Destination Lighting offers free shipping on orders of $50+. If you are not satisfied with a product you purchased from Destination Lighting for any reason (including incorrect merchandise, defective product or item damaged during shipping), you'll need to call for a Return Authorization Number, then ship the package back to their warehouse within 30 days of purchase. See site for full details, exclusions may apply. Shop the clearance section at Destination Lighting and save up to 70% on merchandise. Shop online at DestinationLighting.com and enjoy free shipping on your order of $50 or more. Get 10% off ET2 Pendant Lighting at Destination Lighting with this code. Click link now and save. Act now and save up to 75% on Dolan Designs from DestinationLighting.com. Check out the sale section at Destination Lighting and save up to 50% off lighting and home decor fixtures. Place an order and items ship the same day at Destination Lighting. Click link to shop online. 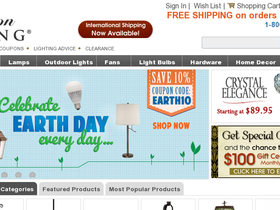 Save an extra 15% on clearance lighting from Destination Lighting when you use this coupon code online. Click to save. Use our coupon code online at Destination Lighting today to save 10% on vanity lighting. Click the link to shop now.